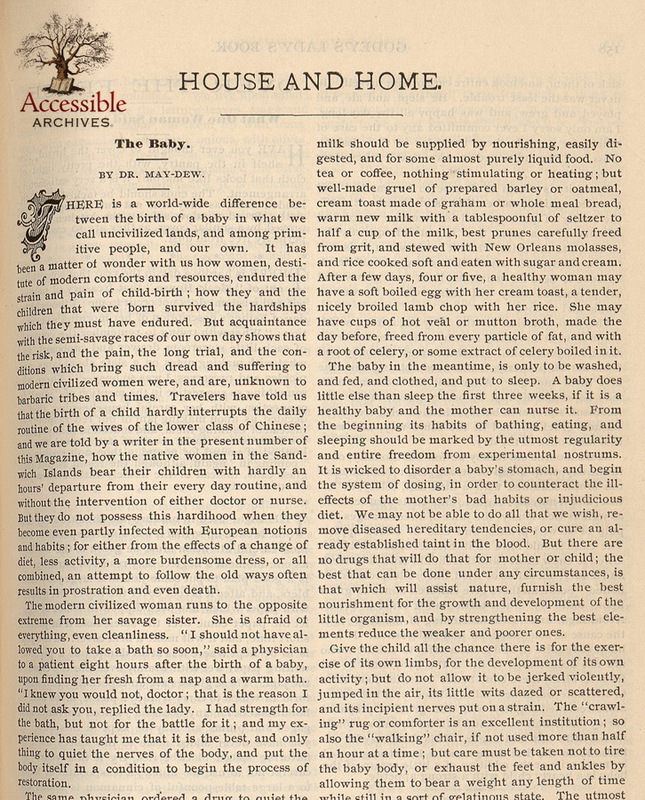 This article on babies by Dr. May-Dew appeared in the House and Home pages of the August 1887 issue of Godey’s Lady’s Book. In the magazine’s prospectus: The House and Home Department deserves careful perusal by mothers and housekeepers; the suggestive series of articles by Dr. May-Dew, and the clever, bright papers of Mrs. E.M. Babcock, whose “Over the Fence, or What One Woman Says to Another,” is one of the most original features ever introduced into this or any other periodical. There is a world-wide difference between the birth of a baby in what we call uncivilized lands, and among primitive people, and our own. 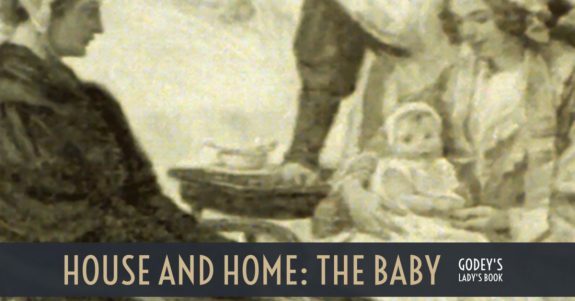 It has been a matter of wonder with us how women, destitute of modern comforts and resources, endured the strain and pain of child-birth; how they and the children that were born survived the hardships which they must have endured. But acquaintance with the semi-savage races of our own day shows that the risk, and the pain, the long trial, and the conditions which bring such dread and suffering to modern civilized women were, and are, unknown to barbaric tribes and times. Travelers have told us that the birth of a child hardly interrupts the daily routine of the wives of the lower class of Chinese; and we are told by a writer in the present number of this Magazine, how the native women in the Sandwich Islands bear their children with hardly an hours’ departure from their every day routine, and without the intervention of either doctor or nurse. But they do not possess this hardihood when they become even partly infected with European notions and habits; for either from the effects of a change of diet, less activity, a more burdensome dress, or all combined, an attempt to follow the old ways often results in prostration and even death. The modern civilized woman runs to the opposite extreme from her savage sister. She is afraid of everything, even cleanliness. “I should not have allowed you to take a bath so soon,” said a physician to a patient eight hours after the birth of a baby , upon finding her fresh from a nap and a warm bath. “I knew you would not, doctor; that is the reason I did not ask you, replied the lady. I had strength for the bath, but not for the battle for it; and my experience has taught me that it is the best, and only thing to quiet the nerves of the body, and put the body itself in a condition to begin the process of restoration. This dosing of the mother, this endeavor to relieve her of the necessary aches, pains, and discomforts of her position, must have a seriously detrimental effect upon the newly-born child. Its mother’s milk in its natural state is its food and medicine; its mother’s milk should be supplied by nourishing, easily digested, and for some almost purely liquid food. No tea or coffee, nothing stimulating or heating; but well-made gruel of prepared barley or oatmeal, cream toast made of graham or whole meal bread, warm new milk with a tablespoonful of seltzer to half a cup of the milk, best prunes carefully freed from grit, and stewed with New Orleans molasses, and rice cooked soft and eaten with sugar and cream. After a few days, four or five, a healthy woman may have a soft boiled egg with her cream toast, a tender, nicely broiled lamb chop with her rice. She may have cups of hot veal or mutton broth, made the day before, freed from every particle of fat, and with a root of celery, or some extract of celery boiled in it. The baby in the meantime, is only to be washed, and fed, and clothed, and put to sleep. A baby does little else than sleep the first three weeks, if it is a healthy baby and the mother can nurse it. From the beginning its habits of bathing , eating, and sleeping should be marked by the utmost regularity and entire freedom from experimental nostrums. It is wicked to disorder a baby’ s stomach, and begin the system of dosing, in order to counteract the ill-effects of the mother’s bad habits or injudicious diet. We may not be able to do all that we wish, remove diseased hereditary tendencies, or cure an already established taint in the blood. But there are no drugs that will do that for mother or child; the best that can be done under any circumstances, is that which will assist nature, furnish the best nourishment for the growth and development of the little organism, and by strengthening the best elements reduce the weaker and poorer ones. Give the child all the chance there is for the exercise of its own limbs, for the development of its own activity; but do not allow it to be jerked violently, jumped in the air, its little wits dazed or scattered, and its incipient nerves put on a strain. The “crawling” rug or comforter is an excellent institution; so also the “walking” chair, if not used more than half an hour at a time; but care must be taken not to tire the baby body, or exhaust the feet and ankles by allowing them to bear a weight any length of time while still in a sort of gelatinous state. The utmost cleanliness can be preserved if regular habits have only been formed. It is neglect, dependence upon the diapered towel, which trammels the limbs and ought to be gotten rid of as quickly as possible, that are responsible for the unpleasant and malodorous atmosphere, that often surrounds a baby , and is doubtless as disagreeable to baby itself as it is to others. We do not know how sensitive a child may be, or how early it is developed; but we know that it is sensitive, and that it is sometimes exhibited strongly at the very earliest age, and it ought, therefore, to be a religious duty to respect its feelings, to satisfy its latent taste, as well as feed its appetite. Precocity is a form of disease to be watched and guarded against, rather than stimulated. It feeds the vanity of parents, and is therefore urged and stimulated to a point that is not infrequently destruction to the child, while it renders it a nuisance to everybody else. Gradual, healthy, normal development is best for whatever lives and grows, and the precocious baby will either die or become a stupid girl or boy. The food question for the baby regulates itself if the mother is normally healthy, has common-sense and good judgment. If she nurses the baby and feeds herself properly, it will need nothing more the first three months. After that the mother’s milk may be supplemented by barley gruel, made with Robinson’s prepared barley, thinned with cream; or oatmeal gruel thinned in the same way, each used as a meal once in the day. At six months old it may be fed additionally, once in the day, with a cup of strong, clear veal or mutton broth, seasoned with a little salt, celery, or lettuce; and it may also begin to take on its own account, as well as vicariously, the juice of sweet oranges, the pulp of stewed prunes, and also of baked apples. The child should have all its first teeth before it is allowed to chew meat; and this should always be fresh and tender, not salted or fried, but broiled, roasted, or boiled. Some mothers give children bones to gnaw upon, and “try” their teeth; but a crust is better. Avoid sugar and much sweetening of the food; it is the cause of sour stomach and indigestion. It is a habit to require it, and is distasteful to children who are not accustomed to it. If the baby must be fed from its birth, there is no better artificial food than to alternate warm new milk, diluted with hot water, and sweetened slightly, with thin gruel of prepared barley made half-water and half-milk, and seasoned with a little salt and sugar. This food may be adhered to for the first three months, but strengthened by more milk or the addition of a little cream, if the baby is a hearty child with a strong appetite.